Winters in Mongolia are extreme. The capitol city, Ulaanbatar, is the coldest in the world. It rarely gets above freezing on winter days, and can often plunge to -40 F at night. To survive, many of the homeless live in the healing ducts below the nation's cities. Warm, well-made clothing can allow a child to go to school or an adult to go to work. In some cases, it can literally save a life. The Dulaan Project, a cooperative effort of the Flagstaff International Relief Effort (F.I.R.E. ), Mossy Cottage Knits and the Kunzang Palyul Choling (KPC) Buddhist community of Sedona, seeks to inspire the local knitting community to help meet the urgent needs of Mongolia's impoverished people. Dulaan is the Mongolian word for warm, not just physical warmth, but also the warm heart of human love and compassion. The knitted items will be included in the yearly delivery made by F.I.R.E. The nonprofit was started by David Edwards, an internationally-known local photographer, in 1993. Through the years, many of the recipients of the clothing have been orphans in Ulan Bator and in more rural areas. "We are up to about 500 items and about 70 percent are for children," said Meredith Potts, director of F.I.R.E. and studio manager for Edwards. 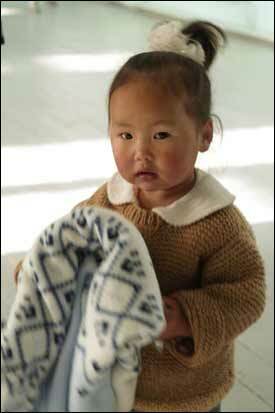 Knitted winter clothing is needed by July 1, in time to be packed and shipped to Mongolia sometime in August. F.I.R.E. volunteers will personally distribute them in Mongolia this fall. Items received after July 1 will be sent in 2006. "Winter clothing for children is great; it's easier to make and we never have enough for children," said Potts. There is a great need for hats, mittens, socks, neck gaiters, scarves and sweaters for all ages from babies to adults, especially for children ages 2-10 years old. Knitters participating in The Dulaan Project can use whatever yarn and colors they like. Clothing should be warm and simple. Links to patterns are posted on The Dulaan Project Web page: www.fireprojects.org/dulaan.htm. There are also patterns for double-thick fleece blankets that require no knitting or sewing. When packing items, the knitter should write their name and address, as well as the number of and types of items in the box, on a piece of paper. Put the paper into an envelope and tape the envelope securely to the box. Send items to The Dulaan Project, F.I.R.E., 107 N. San Francisco St., Studio 4, Flagstaff, AZ 86001. For more information, call 779-1966. The Flagstaff International Relief Effort is a 501c.3 nonprofit organization. All donations are tax deductible. A receipt will be mailed.